Mother of Pearl and Abalone shell have been used for many years in reverse glass gilding, for areas such as the decorative centers of letters, entire letter faces, and as for fill in backgrounds and decorative borders. The desired shapes are cut from shell, then affixed into place. There are various techniques used for affixing shell to glass, many of these are based on personal preferences - some of the first techniques used involved embedding the cut shell into a thick bodied varnish, often mixed with a hardener. 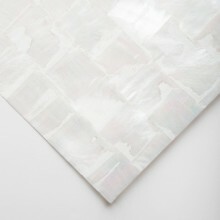 The shell is available in a range of forms - 140x240mm sheets which are 150 micrometers thick, single pieces of shell which are about 0.2mm thick, dots which are 1.27mm thick and crushed shell flakes which are approximately 6mm wide and are ideal for reverse glass gilding, Japanese lacquer work and interior decorating. We also offer ThinLam - 0.12mm paua sheets encased in a varnish to make 0.15mm sheets of easy to use, scratch resistant flexible shell. These are easy to use with laser cutters, hobbyist tools, paper cutters, scissors and exacto knives. 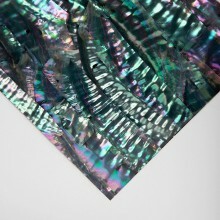 A range of colourful Abalone Shell in ThinLam Laminate (Coated on Both Sides).